It’s humbling to have one of our projects nominated for three awards — and to have them be at both the local and provincial level! Our recent Kanata renovation is a finalist in the Greater Ottawa Home Builders’ Association (GOHBA) Housing Design Awards for Renovation $350,001 – $500,000 and has been named a finalist in the Ontario Home Builders’ Association (OHBA) Awards of Distinction in both the Kitchen Renovation and Bathroom Renovation categories. Here’s a closer look at the project. 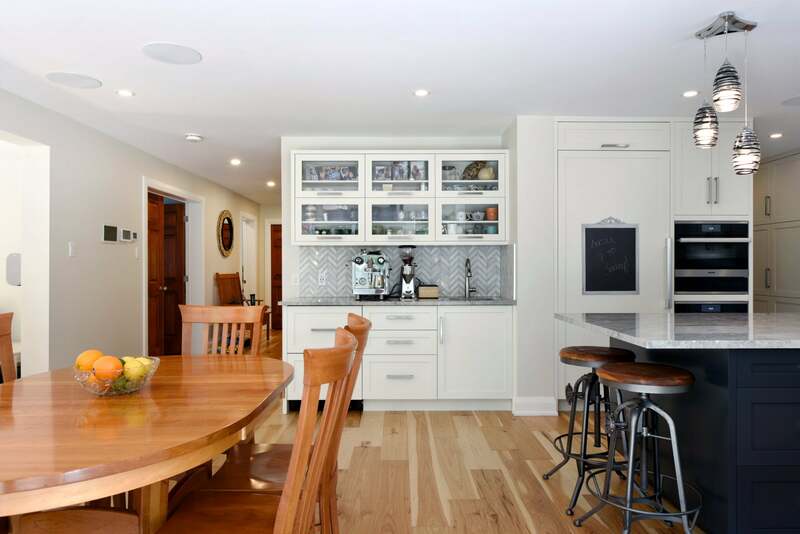 The goal of this main-floor makeover was to maximize efficiency while creating an open-concept layout that fit within the confines of the original space. 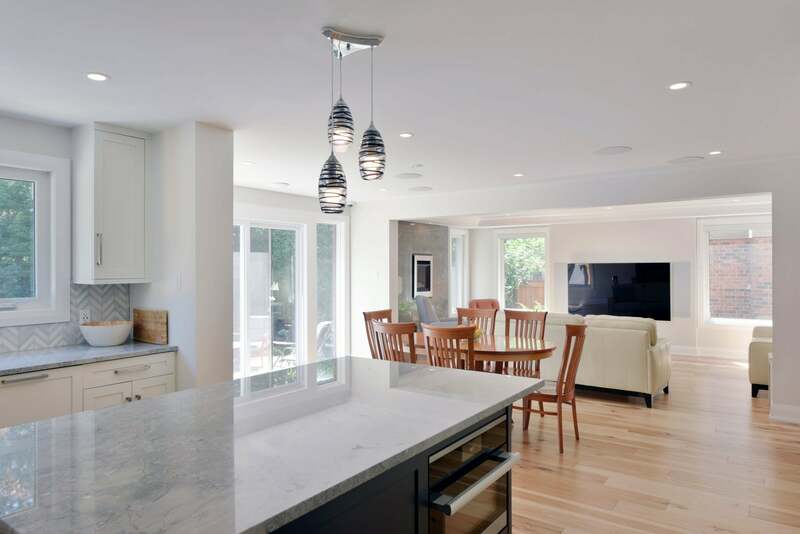 Our Director of Design, Chuck Mills, needed to re-evaluate and reconfigure the home to create the open-concept living plan the owners desired, while making modest updates elsewhere to further improve their living space. 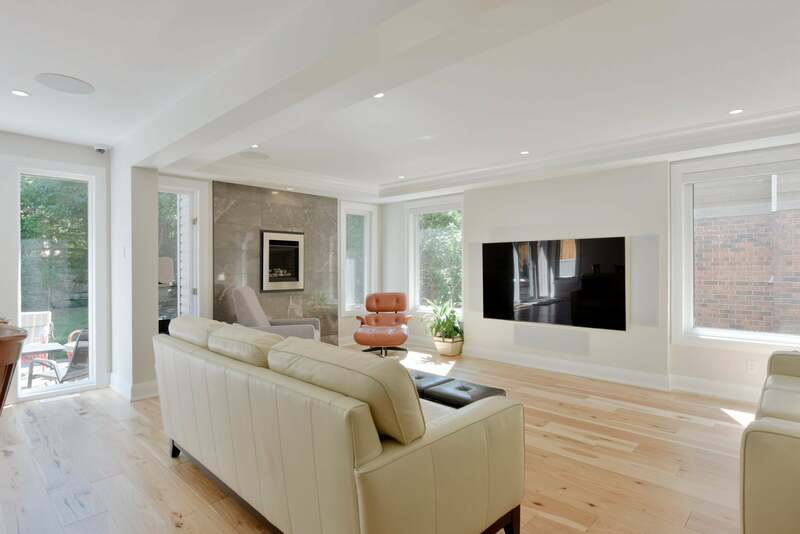 The homeowners took advantage of the comprehensive renovation to outfit the entire space with state-of-the-art home automation. It includes HVAC, security, lighting, AV, blinds, and an espresso machine. Each room offers various “activity” presets to improve functionality of the whole home. For example, the “Morning” preset in the bedroom raises blackout blinds, lowers privacy shades, turns on a dim bathroom light and starts the coffee machine. Security includes cameras, door locks, garage door open warnings and flood sensors. Humidity and temperature alerts maintain systems when the owners are out of town. And the speakers in each room can play together or separately. 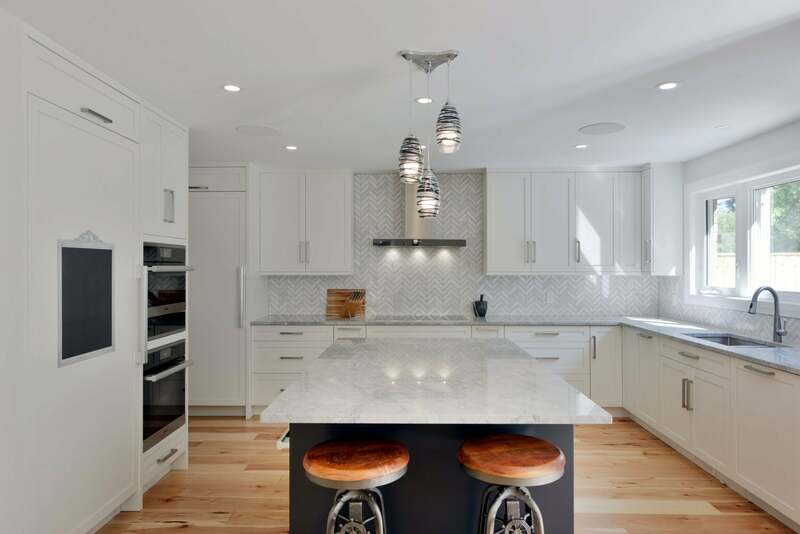 The kitchen is clean, bright and white with grey accents and soft neutrals incorporated in a transitional styling. Warm rustic hardwood flooring flows seamlessly into the open-concept kitchen and is complemented by the white painted cabinetry and Botero granite countertops, while a contrasting custom-painted island forms the centrepiece of the space. This suburban home with many separate rooms and an ’80s flair was completely redesigned. The whole back end of the home has been opened up to create a single space providing an open-concept kitchen, eating area and living room that is all open to the beautiful backyard. The space is full of windows and centred by sliding glass doors onto the patio, letting in lots of natural light. 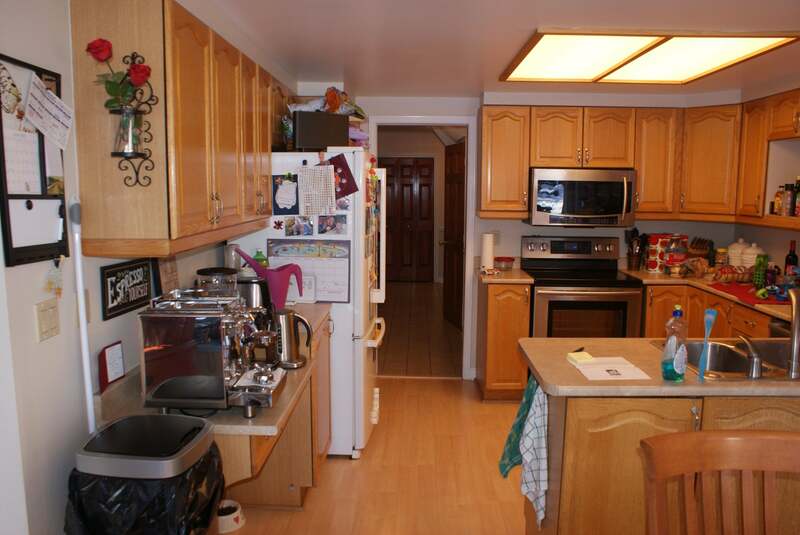 At the edge of the kitchen and the dining area is a fully equipped plumbed coffee station. It is complete with a secondary sink, integrated drawer-style fridge, and glass door cabinets. The espresso machine is connected to the home automation system and can be turned on by the flick of a switch while the homeowner is getting ready in the ensuite upstairs in the morning. A walk-in pantry with walk-through to the formal dining room, which was moved to the front of the home, is yet another example of maximizing storage and function. Large pot drawers are located directly below the cook top with spice and oil pullouts placed on either side, while nearly every other drawer is outfitted with accessories that aid in storage, organization and easy access within the kitchen. These include plate holders, foil dispensers, cutlery dividers, bottle racks, and more. Built-in appliances, including a large full-size fridge and separate full-size freezer, are integrated into the cabinetry with matching door panels. 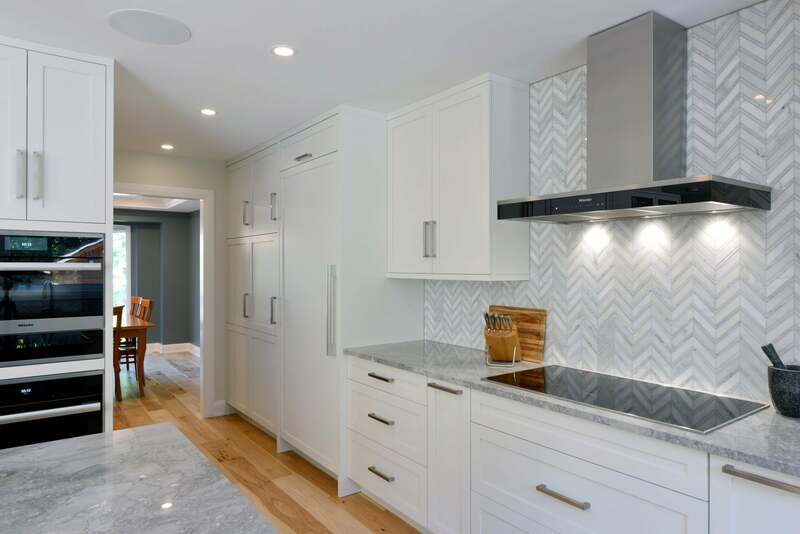 Upon entering the space, your eye is immediately drawn to the large hood fan, which is accented by a traditional herringbone backsplash. In the new master ensuite, we improved functionality by separating the dressing area with vanity from the wet areas. Once again, storage space is maximized with lots of cabinetry. Before: The existing dated kitchen needed a modern treatment and to be opened up to the living area. Before: The existing bathroom lacked space and style due to the dated jacuzzi and surrounding steps.